Fender Play has added bass to its instrument line-up alongside the existing guitar and ukulele lessons. The learning app makes learning bass easier than ever, teaching users skills and songs from artists across popular styles including James Brown, Curtis Mayfield, Maroon 5 and Bob Marley. The bass course is similar to the guitar and ukulele ones already on offer. Players progress through the learning process with simple bite-sized lessons. You can learn essential bass skills, including slap bass, hammer-ons, how to play with a pick, funky slides and how to read rhythm and ghost notes. Many songs on Fender Play feature companion lessons for both bass and guitar, giving aspiring musicians the resources to play with others. “Fender was responsible for putting the first electric bass guitars into the hands of the world’s best players, so it’s only fitting to continue that tradition through a digital lens and inspire a new generation to pick up and play,” he continued. The inclusion of bass introduces new instructors to the app including Pete Griffin, Chelsea Stevens, Ozzy Carmona, Nikki Stevens, Darren McGuire, Dan Ellis, Travis Dykes and Harley Duggan. New players can sign up for a free trial at Play.Fender.com and continue their journey for £9.99 (GBP) a month-with access to bass, guitar and ukulele lessons all in one complete learning package. Additionally, new players have access to a year of unlimited lessons for £89.99, empowering them to learn at their convenience. 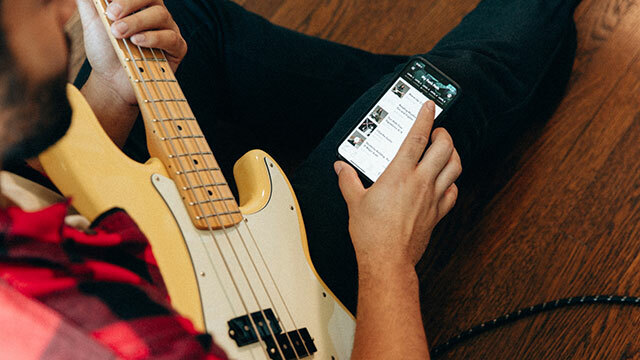 Fender Play for bass is available now on iPhone, iPad, Android devices and desktop.